Our house is drowning in LEGO minifigures. I am constantly finding yellow heads in our laundry, little body-less plastic pants in our beds and tiny swords get sucked up by the vacuum cleaner weekly. We are slowly being invaded by these little quirky warriors, construction workers, mermaids, super heroes and ninjas. Maybe it’s my own fault for being addicted to the LEGO minifigure blind bags. Whenever I see a display of them I have an uncontrollable urge to buy one for the boys, as a special treat. But oops – we have more than one kid, so I need to not buy one or two, but three bags (soon four)… and before you know it, we are ruled by the LEGO minifigures. To bring order to LEGO minifigure town, I had to do something, and do it swiftly. Last year I found the coolest shelves and after LEGOfying them (yes, that IS a word), the kids were immediately on board to organize and display our mighty (and growing) collection of LEGO minifigures. I love these little guys so much that I might just have to make a set of these shelves for our bedroom! 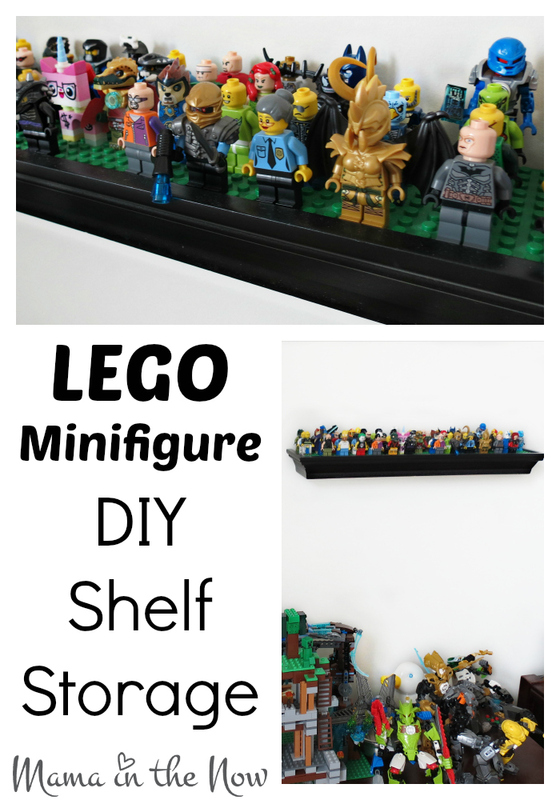 These DIY LEGO Minifigure shelves are the perfect storage and display solution, and they are easy to make! These black shelves are PERFECT for this DIY project. The ledge has a small lip that allows the LEGO plate to be concealed. It is a great fit, actually a match made in LEGO heaven. The set includes the four shelves pictured below. I bought three baseplates for this project. You could use a hot glue gun for this project, but I wanted to have the ability to remove the LEGO plates in the future. The double sided tape has kept the base plates in place without any wiggling at all. Remove the four shelves from their packaging. Place the baseplate on the shelf, leaving 1/4″ from the back edge. Cut the baseplate to fit with regular household scissors. Cover the entire top of all the shelves with baseplates. Some shelves will have more than one piece, cut them to size and fit like a puzzle. Secure the baseplates with double sided tape. VOILA! 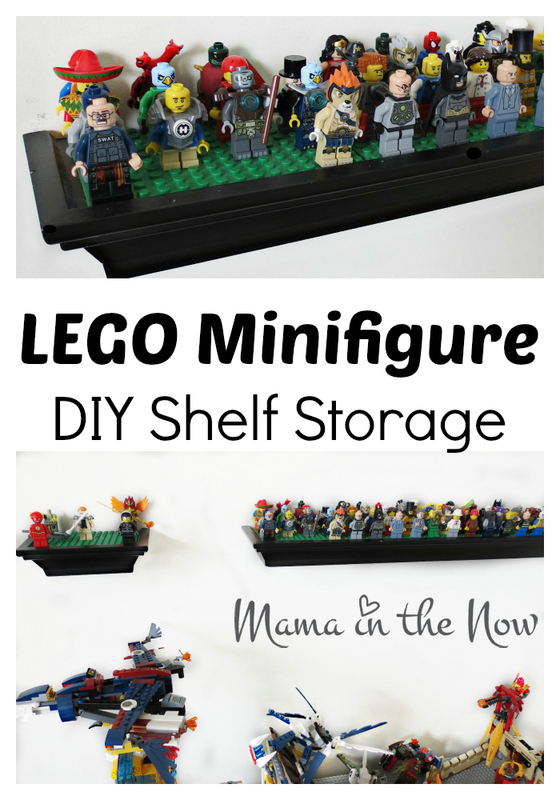 You are now the proud owner of DIY LEGO minifigure shelf storage. Collect all your LEGO minifigure pieces, have fun putting them together and on display! We have our shelves hanging above the boys’ LEGO shelves displaying their largest sets. It is a great way to keep the LEGO minifigures handy for play, but off the floor – which our feet appreciate! 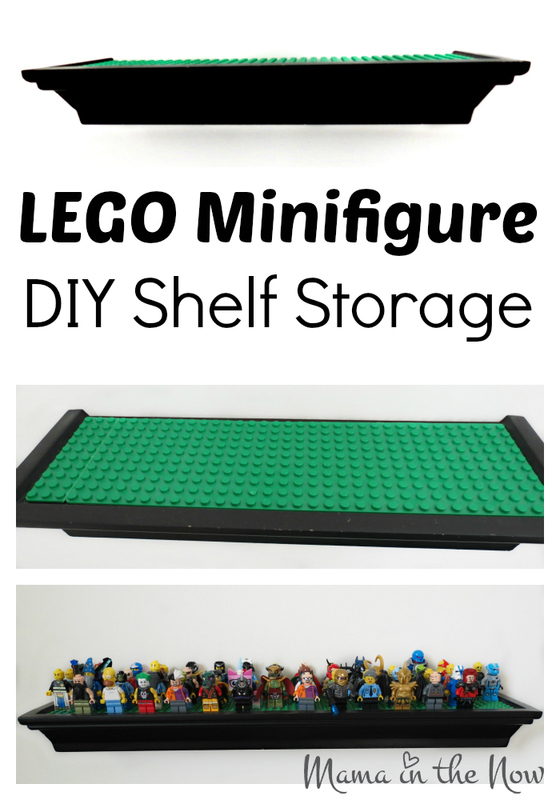 How do you currently store your LEGO minifigures? DON’T MISS THESE TOTALLY RELATED POSTS! Filed Under: Creative, LEGO, Life Style Tagged With: Danish, DIY, LEGO, Pin THIS! This is such a great idea!! I try to get the kids to keep their Legos at their Lego table in the playroom, but you can imagine how that goes 😉 Maybe having little stations around the house would avoid the inevitable horror of stepping on one! My 6yo’s Legos were fine until the baby became mobile and interested. Now they’re EVERYWHERE. Always looking for storage ideas, thanks! Genius! What a great way for the kids to showcase their little figures but also keep things organized. I can even imagine several of these along a wall. This is such a brilliant idea. I never thought of this before. Yes, I admit, currently my TV console has become a display table for those Lego creations, but it is kind of disorganized. Having separate shelves dedicated for Legos would make it way nicer. Great project! Where did you purchase the shelves? Sorry if you answered, I didn’t see it. Great way to keep the LEGO minifigures out of the reach of younger siblings. I and sharing this on Pinterest. Thank you SO much for sharing. Yes – the siblings… they do tend to make minifigures disappear! I am SO glad you found this useful!!! We love our shelves – especially because that means less LEGO on the floor to step on!